The second December recipe for Barefoot Bloggers was chosen by Michelle of Welcome to the Club. She chose sausage-stuffed mushrooms, which was a perfect choice for December. I actually made these 3 times: for my extended family's Christmas Party, Joey's family gathering, and finally for New Year's Eve. They were all eaten at all of the parties. In the past when I make stuffed mushrooms, I've kept it simple: low fat cream cheese, bulk sausage, Parmesan, and parsley. These were from Ina, so of course they were slightly more elegant and upscale. The mushrooms are stemmed and tossed in olive oil and Marsala wine. Then the stems are chopped and sauteed with Italian sausage, green onion, garlic, panko, and parsley. Rich Marscapone cheese is then swirled in, and the mushroom caps are filled and baked. The result is pretty much the perfect stuffed mushroom. A little salty from the sausage and Parmesan, earthy from the mushrooms, and a little sweet from the Marsala wine and Marscapone cheese. They come together quite easily; the only issue I had was that there was still plenty of filling leftover after stuffing the mushrooms. Therefore, I suggest that you use 16 ounces of mushrooms. And don't worry about that being too many. There won't be any leftovers, no matter how many you make. 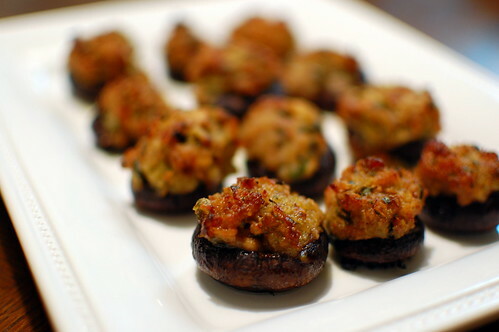 I've been looking for the perfect stuffed mushroom recipe to add to my collection!! Thank you. These are ridiculously good! I made them for Thanksgiving and then again for a work function. I used spicy turkey sausage for a slightly more healthy variation and I'm thinking I actually liked them a little better than the original recipe. Either way you're bound to love them. Delicious thanks for share it, new recipe for make tomorrow, thanks.